Focus E15 Mothers, a group of young single mums, fighting for their right to social housing. A couple of extracts from Prymface’s report in the Telegraph. Nearly 100 people gathered on Central Park in East Ham the other week. They then proceeded to walk through the streets with banners and placards and drums and microphones. Men and women, young and old, black and white, were marching together in solidarity. No police were needed. No trouble was caused. But their presence was definitely known. The march was led by Focus E15 Mothers, a group of young single mums, who lived in the Foyer, the UK’s largest hostel for homeless young people in London, until the Government cuts for their support forced their eviction. 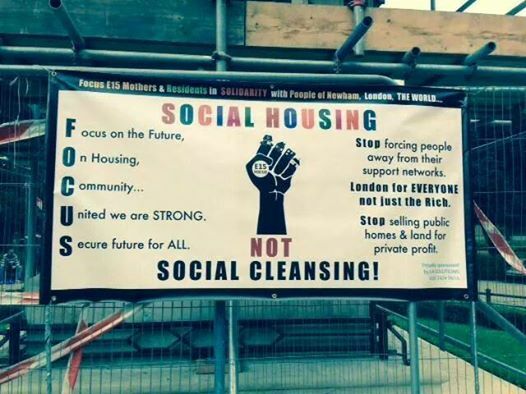 Last year they were served with notices to quit by the East Thames Housing Association. They were referred to Newham council and were told look for private rented accommodation in Manchester, Hastings and Birmingham, miles away from the support they had in their local area and from where they were bringing their children up. This was after they were told to scour Newham and London – but due to the shortage of affordable accommodation in the capital, they were advised they “may have to look outside of the capital”. Young mums are often accused of having a baby to “get a house” and so there is an unspoken concern that if vulnerable mothers were actually provided with affordable stable housing then teenage pregnancy rates would go through the roof. But we need to start looking beyond myths and stereotypes. Girls don’t get pregnant on their own. It takes two to tango. Many have suffered abuse and violence. For lots of these women, being a mum is a chance to turn their lives around, take control and to focus on their future. But if all they face are barriers, and if all their aspirations are ignored then how can we call ourselves a civilised society? Many of the Focus E15 Mothers were vulnerable, but living in their hostel had started local college courses, built support networks and most importantly, their children were all settled in schools. These want a better future for their family. And that is why they are fighting back, asking for social housing in the area where they and their children feel safe and settled. They started campaigning nearly a year ago and will continue until someone listens. Stable and secure housing should be a basic universal right, just like healthcare, not a luxury for the privileged few. Next The Madness of Militarism : What’s that got to do with Youth Work and Young People?